8:45 a.m. - 4:00 p.m., Wed., Thurs., Fri., Sat. & Sun. The classes are held at 3800 N. Riverside Dr., Indialantic, FL 32903. As usual -- You Can Choose Your Days! Session cost is $70 per day, but if you choose to attend 3 or more days, you will receive a $10 credit off each day. Deposit of $50 will assure a spot in class. Please call Marsha Savage in Smyrna (Preferred 770-926-3623 Home, or after Feb. 17 cell 770-853-4696) or e-mail her: marshasavageart@yahoo.com if you have questions. Let her know you are interested in the class and for the address to send your deposit. The workshop will be studio and/or plein air (outdoors from life) according to the wishes of each student each day. Usually there are some in the studio and some outdoors! 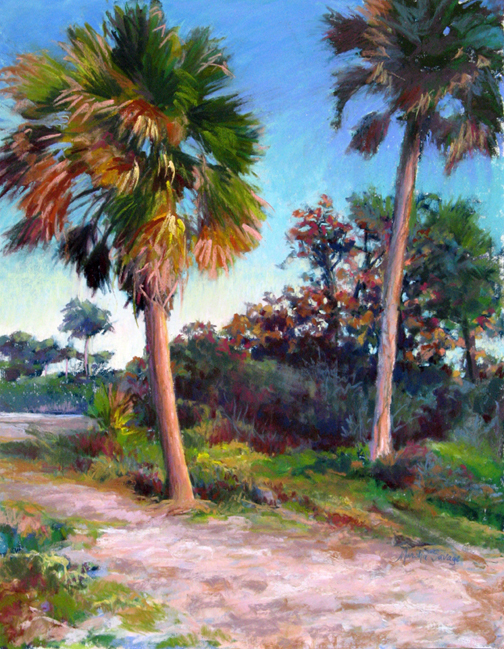 This workshop is geared for any medium, and demonstrations will be in pastel and in oil. This workshop is appropriate for beginning or advanced student. All students will receive individual attention geared to their level. If you are painting in studio, bring photographs (no copyrighted material, please), or you may paint from hers. You may choose which of the days you can attend, according to your needs, and plan studio or plein air. The property at Riverside Drive is beautiful and has many great painting spots. Pastel is my main instruction medium, and beginners will be very comfortable taking this workshop to learn pastel techniques. Students taking the workshop using oil or acrylic will receive the benefit of my experience in oil and acrylic. There will be at least one demo in oil. And, most theories are the same no matter the medium you use. Call me if you have questions. A supply list will be given upon payment of deposit. Also, do contact Marsha Savabe if you are a last minute decision to attend ... she can usually work in another person and she can send you any information you need. The class is relatively small and normally not more than about 10 people. Emphasis is on composition and value, with temperature and color a strong second! There will be added emphasis on quickly creating a thumbnail sketch to work from, blocking in the darks and lights, and finding the colors and developing the painting. This class is not just to paint a pretty painting from start to finish; the principles of starting and working through the painting are foremost. If you are interested, please contact Marsha Savage ASAP! Returning students are given priority, but there is usually space available for several new students each session. This is a fun class, especially inspirational with all the artwork being created around you by the other students!